After ousting Sandra at last week's Tribal Council, Nuku wins at the Reward Challenge which allows the tribe to bond over the most disgusting looking pizza. But when you're hungry, you're hungry. Varner's hungriest to stay in the game, trying to throw the target on Ozzy. Mana bonds in a different way, with emotional outpourings from Sierra, Aubry, and Brad about how the game of Survivor changes you. 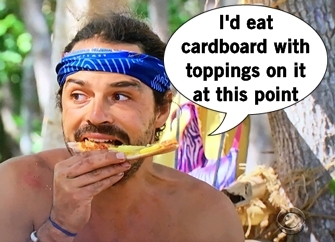 Being vulnerable helps bring Brad closer to Aubry and Cirie, which means Brad has a group of five he can roll with. 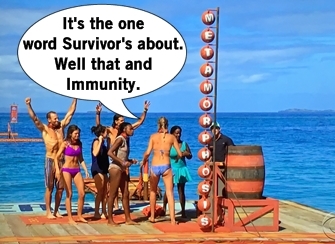 Nuku loses their second consecutive Immunity Challenge with Mana able to solve the "Metamorphosis" word puzzle first. Varner knows he's likely going home and requests one-on-one time with everyone. However the tribe is conflicted because Ozzy is a threat and they're not sure he'll be loyal to their group. Zeke in particular likes Varner, but has worked closely with Ozzy and considers him a good shield. Zeke is very candid with Varner that there's a 50% chance Varner is leaving and says he'll try to save him. Realizing that Ozzy and Zeke might be working together, Varner tells this to Sarah and Andrea. Varner goes on about not going quietly and unfortunately, he's correct. Tribal Council time. Varner acknowledges he's going home and pleads one last time for the divided tribe to vote off Ozzy. After ranting about "deception," Varner turns to Zeke and asks, "Why haven't you told everyone you're transgender?" The tribe is shocked and appalled at Varner's behavior, quickly defending Zeke. I could go on explaining as Varner tries to defend his actions and apologize, but you've seen it and can understand the magnitude of Varner's remarks. After Zeke has time to think and compose himself, he's able to speak about his life and wanting to be known as Zeke, and not defined as the transgender Survivor player. But Zeke has changed because of Survivor and become a better man, acknowledging his own personal "metamorphosis." Sarah gives an emotional speech condemning Varner's actions and talks about being glad to know Zeke for who he is, given her own conservative background. 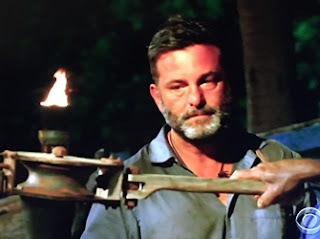 The tribe does not have to vote and each agree to eliminate Jeff Varner from the game. Zeke and Varner shake hands and hug, and Varner's torch is snuffed. This Tribal Council was so hard to watch but at the end of it all, we can all see that Zeke Smith is a class act and an amazing man.